After having spent the past few years developing business management tools and fixing up the content management system and back end, it was finally time to do the same to the front end. We removed virtually every remnant of the code left by the previous designer, allowing the site to finally enjoy the full benefit of error-free clean and concise coding. Our team implemented fresh graphics and a new look developed by a sub-contracted graphic designer. The designer handles all the layouts and photoshop design work, working off the recommendations from our teamd and the site owner. At the end of the day, we handled all the coding and implementation needed to get this site up and running with the graphical facelift. One of main forces which drove for the 2013 facelift was the necessity to implement a responsive design. Again, where the designer handled the graphical work, JaPache Web Solutions programmed the actual responsive design, including managing the page breaking points and all applicable format changes. Now, the website “snaps to” whichever screen it is currently being browsed from, so as to offer a uniform browsing experience. The driving principle behind 21st Century Food’s online meal delivery service has always been to let users order fodd. The new navigation and layout now further streamlines and facilitates this process, allowing users to sign in and make it to the menus in 3 clicks or less. The new touch-screen friendly menu system which categorizes meals by type and signals which ones are healthy choices, spicy or vegetarian effectively allows users to more easily browse the assortment of dishes offered by 21st Century Food. 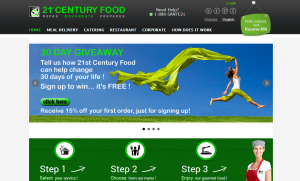 Initially, when the site first launched, 21sy Century Food operated around 3 main divisions which each had their own separate login and account systems. Unfortunately, this lead to a lot of confusion for users who were used to only needing a single login for the site (such is the standard these days). Our team handled the massive user merge, combining all associated accounts for each user into a single massive account. Considering 21st Century Food has literally thousands of accounts, this was no small process. Fortunately, now that it’s over, user can order food, check past orders and handle everything from a single account.